There are so many “vintage inspired” items out there that are just so garish because the manufacturers don’t seem to care about those kinds of details. It’s nice to see an artisan take pride in such accurate reproductions. Soon they will be adding a bunch more designs such as garlands and tree toppers so be sure to add them to your favorite sellers to stay updated. 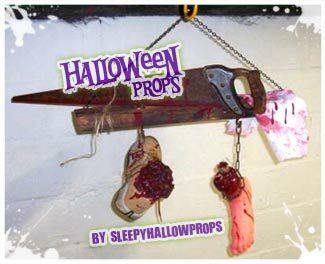 If you’re a regular here, you might remember Sleepy Hallow Props from last year. We’re glad to see that Erik is back making his quality homemade props again this season. Because what’s Halloween without a bucket of bloody guts or a killer butcher’s meat hanger? Do you sell your Halloween themed goods online? Know of a great Halloween e-store that we should feature? Get in touch! .99 cent shipping on orders $60+. No coupon needed. Offer ends August 22, 2008.